Cheesecake is one of the most popular, and one of the most versatile desserts around, since you can customize the crust and the filling to fit any flavor cravings. The possibilities are truly endless! 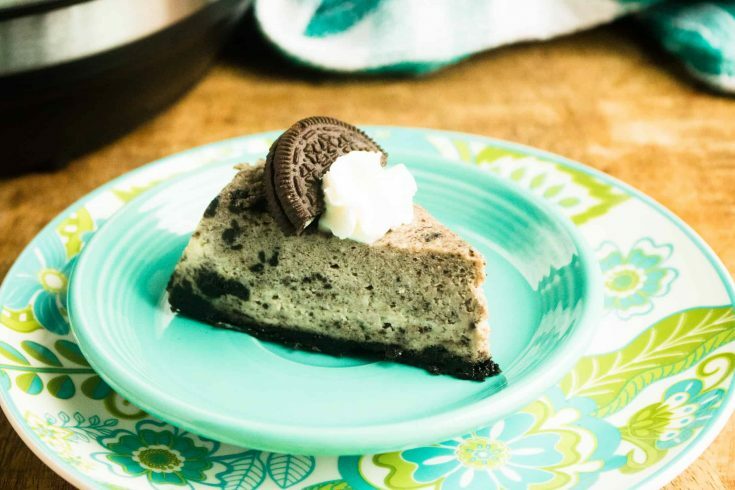 This Instant Pot Oreo Cheesecake is an amazing family-approved version. It’s so moist and delicious, each bit almost melts in your mouth! 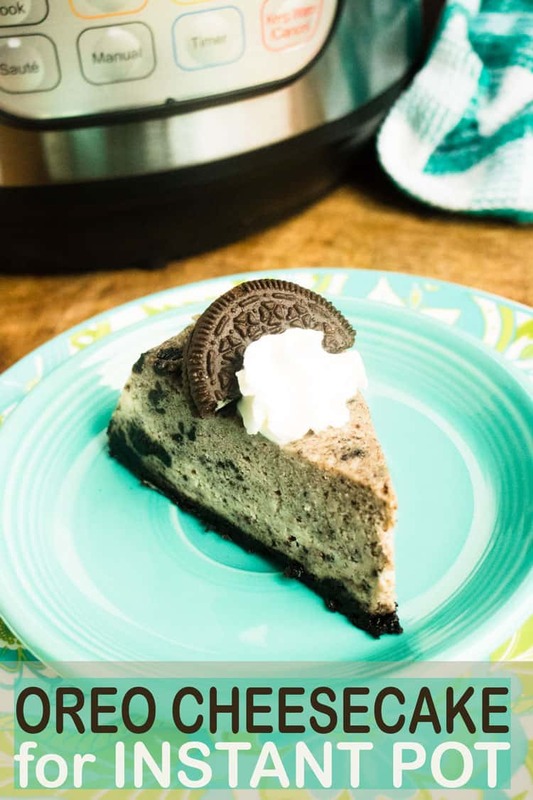 With a crunchy Oreo cookie crust, layered with a sweet and creamy Oreo cheesecake filling your tastebuds will be in heaven with the classic cookies and cream flavors! At just 7 inches, this cheesecake is the perfect size! You’ll have just enough for everyone to enjoy, without all the extra leftovers tempting you in the fridge for days afterwards. 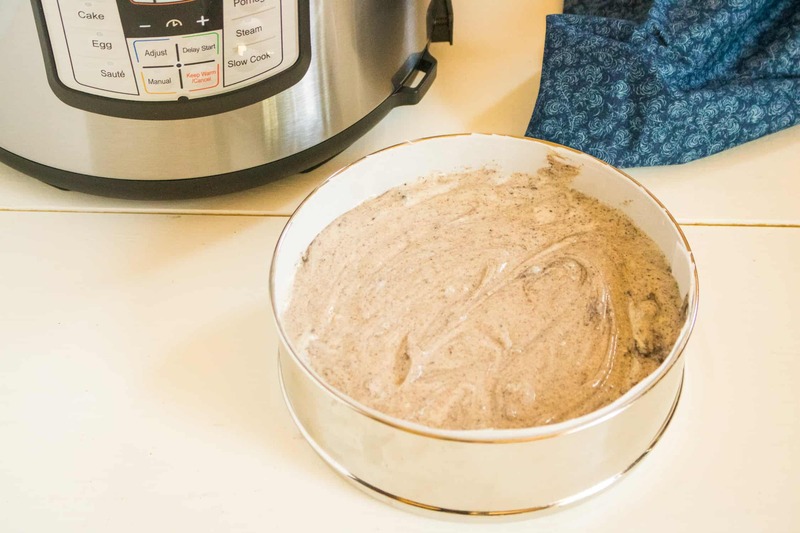 The steamy environment that pressure cooking creates results in an amazingly smooth and creamy cheesecake. Plus, it is so much faster! 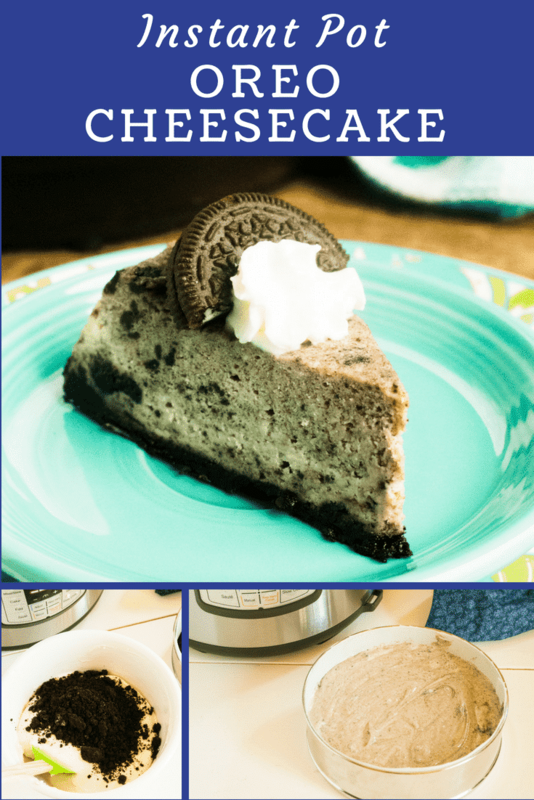 Traditional cheesecake recipes require over an hour of baking time, while this Instant Pot Oreo cheesecake recipe cooks in just 35 minutes (plus another 12 minutes of natural release time). Tip #1: Be sure to take the time to run a fork back and forth through the cheesecake several times to remove air bubbles. Otherwise, during cooking the air bubbles will try to escape and cause your cheesecake to crack. Although cracks won’t change the deliciousness, it just won’t be as pretty and presentable. Tip #2: When you are ready to place your cheesecake into the Instant Pot, you’ll want to be sure to make a sling out of aluminum foil. This will give you “handles” to easily get the springform pan in — and especially out of — the Instant Pot. To make a sling, simply take 2-foot piece of aluminum foil from the roll and fold into thirds. Place the springform pan in the center of the strip, and keep a finger on each side the pan (to avoid tipping) while holding the ends of the sling to lower into the Instant Pot. 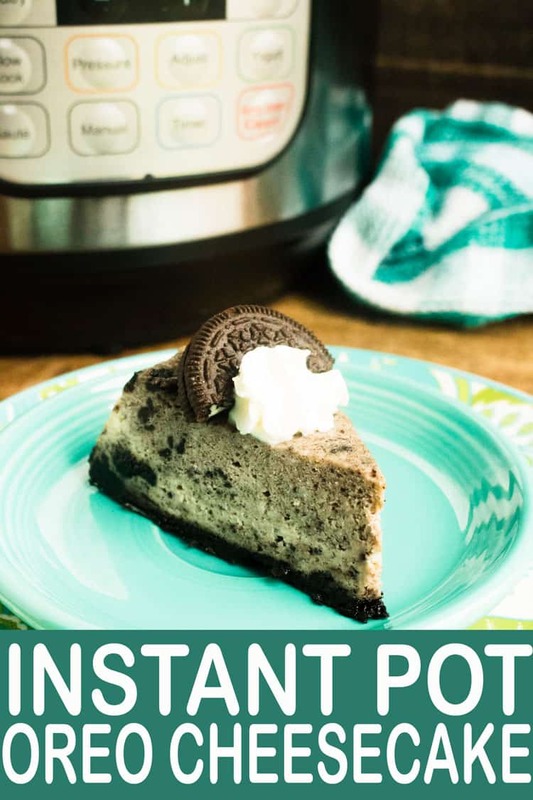 Do You Need A Special Pan to Make Instant Pot Oreo Cheesecake? No and Yes. You’ll use a springform pan for cooking just like you would when baking a cheesecake in the oven. However, you’ll need to get a small 7-inch springform to fit inside the Instant Pot. Step #1: Combine Oreo crumbs with sugar and melted butter then pat down on the bottom of a 7-inch springform pan sprayed with non-stick cooking spray. Step #2: Cream together the cream cheese and sugar until smooth and then mix in the eggs one at a time. Next, add in the vanilla extract and sour cream until smooth. 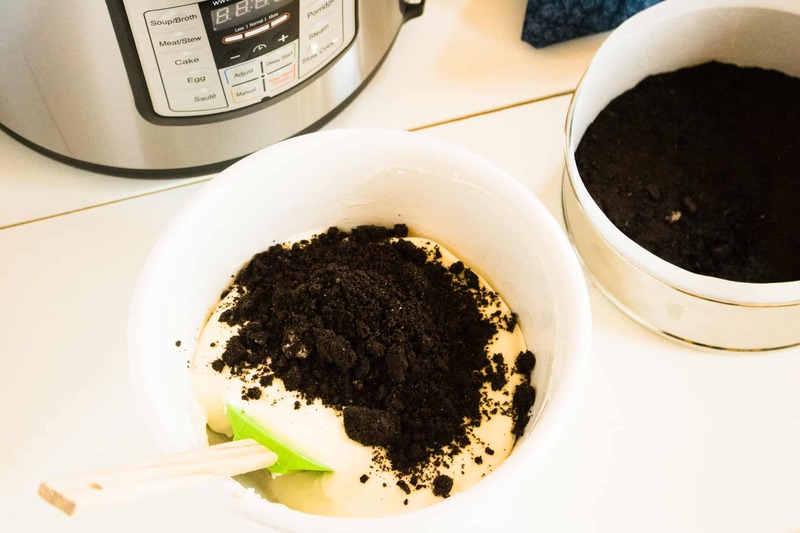 Step #3: Stir in the Oreo crumbs. 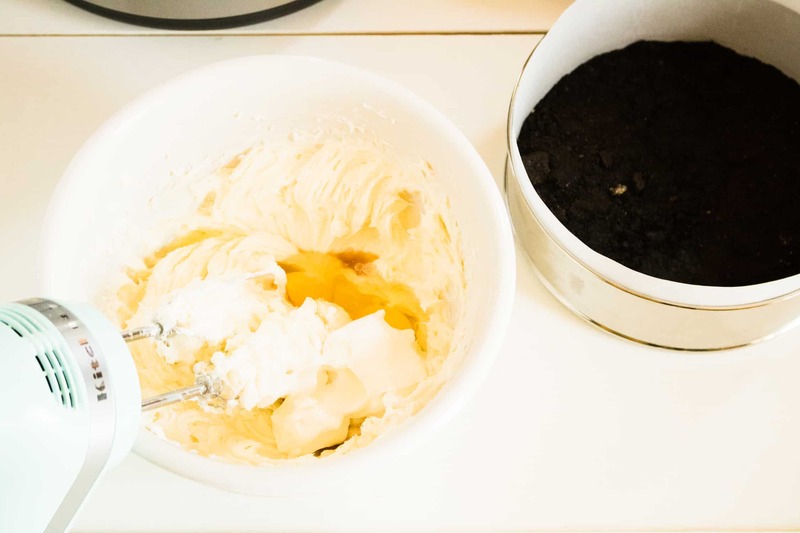 Step #4: Pour the cheesecake mixture into the springform pan on top of the Oreo crust. Step #5: Run a knife back and forth through the cheesecake several times to remove air bubbles, and then cover with foil. Step #6: Pour two cups of water into the inner pot of the Instant Pot. Step #7: Make a sling out of aluminum foil to lower the pan into the pressure cooker. 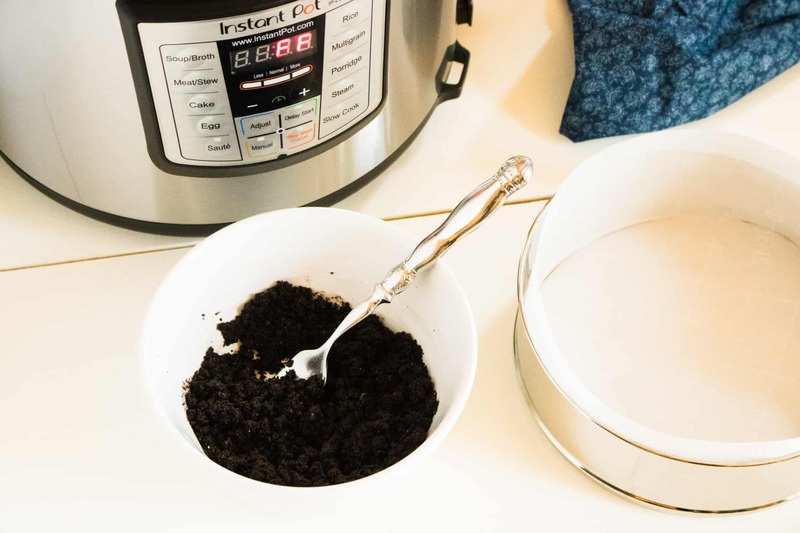 Step #8: Close the lid of the Instant Pot and turn to sealing position. Step #9: Set for a manual high-pressure time of 35 minutes. When the time has finished, allow for a natural release for 12 minutes before letting out the rest of the steam. Step #10: Cool on the counter for an hour and then put in the refrigerator and cool for an additional 4 hours. This Red Velvet Poke Cake is a fun twist on the classic poke cake recipe. Simply bake a red velvet sheet cake, poke holes, fill with white chocolate pudding, and top with a homemade cream cheese and cool whip frosting. Delicious! Lemon Blueberry Cake Roll — a moist and spongy cake rolled around a thick, creamy, lemon filling with sprinkles of fresh blueberries. So YUMMY! Made with apples, dates, and pecans this Easy Slow Cooker Apple Bread Pudding is not your traditional bread pudding, but it’s still a crowd pleaser! 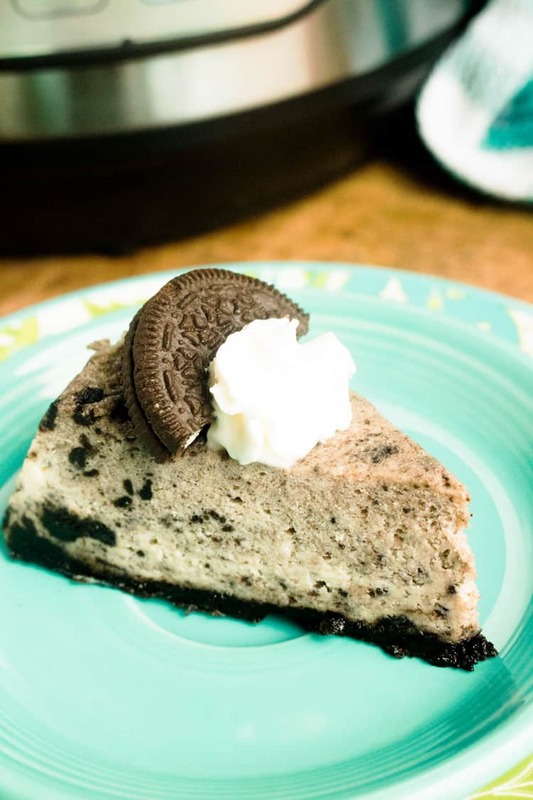 Instant Pot Oreo Cheesecake infuses delicious cheesecake with your favorite cookie! Combine Oreo crumbs with sugar and melted butter and pat down on the bottom of a 7-inch springform pan sprayed with non-stick cooking spray. Mix in the Oreo crumbs. Pour into springform pan on top of the Oreo crust. Run a knife back and forth through the cheesecake several times to remove air bubbles, and cover with foil.